XPRS is a new website builder from IM Creator. XPRS websites are created by stacking sections on a web page. Example sections include maps, logos, team listings, forms, and photo galleries. Once you select a section you are free to edit the elements (reorder them, delete them, etc.). Most sections look attractive and you get a wide selection of sections. However, you cannot move elements around by hand, the upside of this is the structured format ensures your website looks good on mobile. On the whole, the XPRS interface is very slick. Plus, you get beautiful interactions and animations. A highlight of the app is you can easily copy sections and paste them on other pages. However, it is a bit difficult to build structured elements such as eCommerce and blogs, and you need to spend time and effort to get the hang of it. You can build your site with the app’s unique POLYDOMS (patent pending) smart content blocks that can be built and designed in multiple ways. You can easily add sections, mix the designs, customize, and publish. There is no need for coding or expensive developers. Your site will look good on all devices including smartphones, tablets, and PCs. Though the app uses cutting-edge designs, the interface is straightforward and simple. There is no need to re-size long texts or crop images – it’s automatically done for you, ready for all devices. Get unlimited hosting and unlimited bandwidth. The vendor thinks websites shouldn’t cost money and that they should be available to all. Any website built with IM XPRS is web standards-compliant and looks and presents good on smartphones, tablets, Macs, PCs, and even older browsers. Get free unlimited hosting and connect your domain – all in a seamless and simple process. Any website created with IM XPRS or IM Creator is hosted on Google’s and Amazon’s secured servers: It’s fast and safe, and also includes unlimited storage and bandwidth. Whether you are new to building websites or an experienced web designer, the vendor’s friendly and professional support team is ready to assist you around the clock. Sell any product, just add a price to any item – and you have an online store with full professional credit card checkout, management console, and analytics. Powered by ShopRocket. The app’s templates are designed based on the latest trends in web design, by experienced and professional web designers. You can make use of attractive responsive galleries, parallax, and hover effects, with just a button click. You can use the XPRS mobile app to edit your site, add blog posts, and upload images, all from your mobile. If you are considering XPRS it may also be sensible to analyze other subcategories of Best Website Builder Software listed in our database of B2B software reviews. It's essential to note that hardly any service in the Website Builder Software category is a perfect solution that can meet all the needs of all business types, sizes and industries. It may be a good idea to read a few XPRS reviews first as some solutions might perform well only in a really narrow group of applications or be created with a very specific industry in mind. Others may work with an intention of being easy and intuitive and as a result lack complicated elements desired by more experienced users. There are also services that support a broad group of customers and offer a rich feature toolbox, however this frequently comes at a more significant price of such a solution. Make sure you're aware of your needs so that you buy a solution that provides all the features you search for. How Much Does XPRS Cost? 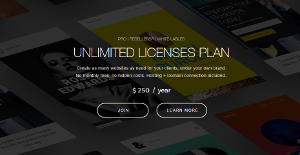 XPRS offers a single enterprise pricing plan for unlimited licenses priced at $250/year. With this plan, you can create as many websites as need for your clients, under your own brand. There are no monthly fees or hidden costs. Hosting + domain connection is also included. We realize that when you make a decision to buy Website Builder Software it’s important not only to see how experts evaluate it in their reviews, but also to find out if the real people and companies that buy it are actually satisfied with the product. That’s why we’ve created our behavior-based Customer Satisfaction Algorithm™ that gathers customer reviews, comments and XPRS reviews across a wide range of social media sites. The data is then presented in an easy to digest form showing how many people had positive and negative experience with XPRS. With that information at hand you should be equipped to make an informed buying decision that you won’t regret. What are XPRS pricing details? What integrations are available for XPRS? XPRS integrates with Shoprocket, a third party shopping cart provider for eCommerce. If you need more information about XPRS or you simply have a question let us know what you need and we’ll forward your request directly to the vendor.